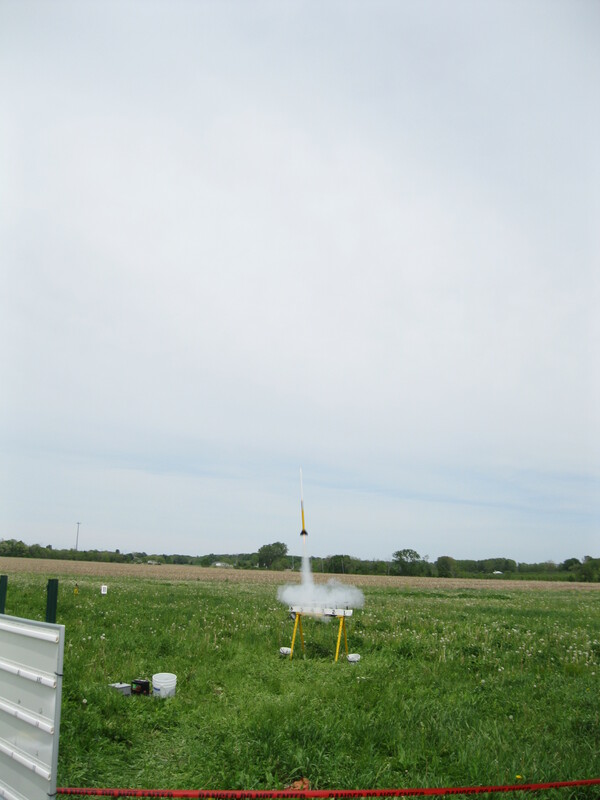 The Artemis Medium Power Booster project had a productive day with six text book test flights, which causes us to declare the testing phase for the booster over, and we officially have a new launch vehicle! 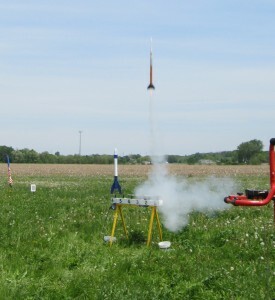 Six flights were completed during the GLRMR-X (Great Lakes Regional Meet Revisited 10), an annual regional rocket launch meeting. For the first two test flights, Artemis booster #2 (orange) was set up as a standard “1B” flight trial configuration. Both flights went as good as the earlier flights with booster #1. The booster reached its expected 700 foot altitude, and no structural or functional concerns were found, and all systems performed “textbook perfect”. The next two flights were done with operational configurations. Artemis booster#2 was configured as a “1E Launch Vechicle”, and test flown on a D12-5 motor to a successful, and beautiful launch. From there, we stepped up to the E-9 motor, and flew two more flights of the ArtemisV launch vehicle using the E-9, and two E-9 flights on the Artemis 1E Launch Vehicle. 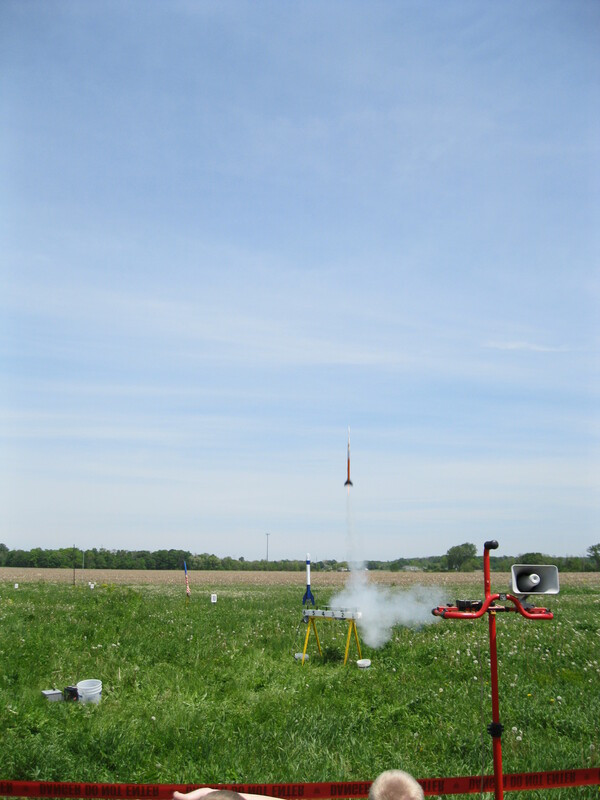 Our first operational flight of the Artemis 1E involved flying an electronic altimeter in the payload section. 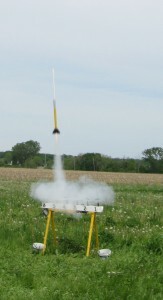 The launch was not “straight up”, but angled into the wind due to the fact that the wind speeds were picking up. The altimeter recorded a height of 845 feet that time. “Straight up” flights seemed to gain about another 150 or so feet. 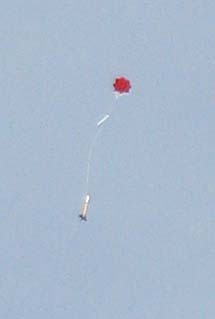 Long range zoom of the Artemis V / 003 shortly after parachute deployment. We’ll post flight log information in the next few days, but all in all, a great day for CPG Aeronautics!